← Safina “Backs” Out of Brisbane. Hugh Hayden Helps Roddick with Unique Tennis Chair. I was able to speak with up and coming designer Hugh Hayden about his unique furniture using used tennis balls and how he’s helping out with the auction at the Andy Roddick Charity Event happening this weekend in Boca Raton, Florida. How did you get involved with Andy Roddick’s Charity Event? There’s an auction and gala event this Saturday (December 12th) at the Boca Raton Country Club as part of the event for his foundation. They will be auctioning off a chair made with balls Andy hit with during the U.S. Open. But since he only got to the third round this year it has other balls from some of the finals matches mixed in with it so that’s how I’m participating. How were you able to get a hold of the balls Roddick hit during the Open this year? Beforehand we contacted someone at the USTA and so they had someone put his balls aside that he hit with. It takes about 550 balls to make a chair so since Andy didn’t use that many in his matches we just took other balls that were used at the Open. Tennis Chair created by Hugh Hayden. What was the initial inspiration for using tennis balls in furniture? 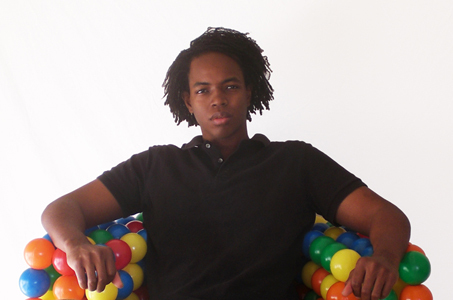 At first I was making furniture out of children’s playpen balls. Then a family friend of mine whose father was an avid tennis player had all of these used tennis balls. And when I asked him why he had all of them, he said it was because we can only use them for so long and then they lose their bounce. And so from that I figured I could use the tennis balls to make chairs. What new projects do you have coming up for 2010? I’m not going to keep working with balls but with existing materials and objects to make chairs with a responsive back. The backs of the tennis ball chairs respond to the contours of your back when you sit in them and are quite ergonomic. So the next line of chairs will continue this idea of a responsive chair that leans back into your movement while using existing objects and salvageable materials. For more information about Hugh, visit his website here. For more information about the Andy Roddick Charity Weekend, click here. Advantageously, the post is actually the freshest on this precious topic. I fit in with your conclusions and will thirstily look forward to your incoming updates. Just saying thanks will not just be enough, for the fantasti c clarity in your writing. I will instantly grab your rss feed to stay abreast of any updates. Good work and much success in your business efforts!